Spotlight the movie has a lot in common with the Boston based investigative reporting team that it depicts. It eschews flash and flair in favour of hard work and facts. The miscellaneous detritus is also ignored so that more time can be spent dealing with the core issues, and there are no shortcuts taken. The process will be followed. Unlike the police force Spotlight do not have many cases underway at the same time, allowing them to commit all efforts into the task at hand. Where police are actively shunned and loathed by even law abiding citizens, there is appeal of talking to the press. Of being relevant, known, appearing in the paper. Set early in this millennium, the Spotlight team are introduced as a once prestigious unit fading from relevance thanks to the rise of the Internet and the other distractions modern life brings. New editor Marty also arrives promising cuts. As an in depth team focussing on one story at a time Spotlight realises they need an important story to chase, and they need it now. When a lead appears that suggests that not only are multiple local priests guilty of child abuse, but the church leaders have actively sought to cover over these indiscretions, the team have a case to sink their teeth into. Of course taking on the Catholic Church in a town predominantly Catholic brings attention. The church is well funded and strong. Decades of repressed information and ‘public secrets’ aren’t made available freely. 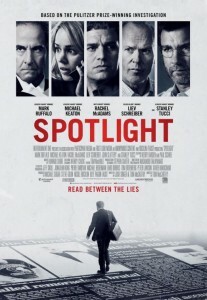 The Spotlight team is only four deep and isn’t nearly as heavily backed. Walter ‘Robbie’ Robinson (Michael Keaton) runs the group, with investigative reporters Mike (Hulk) and Sasha (Rachel McAdams) in the field and Matt (Brian D’arcy James) manning the office. Long hours are spent delving through reference materials and local historical documents. There are hundreds of interviews – all conducted pad with a pen and a pad – during which uncomfortable confrontations arise frequency once the tough questions are posed. As mentioned process and leg work are the cornerstones to… gradual progression. The film too takes its time and is ruthlessly efficient. Sparse and with little music, while the eventual outcome is long since publicly known the impediments from both the church and within the newspaper cast doubt as to whether it could be reached. The acting is excellent, as you would expect with the cast. It is actually Ruffalo who emerges with the meatiest role. For a procedural this is compelling stuff. Even the scenes without much action crackle as the tension builds. Final Rating – 8.5 / 10. Spotlight is not a film you’ll watch 13 times in the next couple years, but it is an extremely effective film that every adult should see at least once.